The museum is open from 10am-4pm and Snow Day activities will run from 10am-2pm. Activities include a 20-ton snow pit, slingshot snowballs, Dave the swatting robot, an ice sculptor, icicle xylophone, food trucks and more! In addition, admission to Snow Day includes exploration of the entire Science Mill and our current 3D movie, Waking the T. Rex, will run every half hour beginning at 11am. Visitors may park in front of the Science Mill and around Courthouse Square to enter through the main entrance on Lady Bird Lane. NEW this year, we will have additional parking and a second entrance in the field on the west side of the Science Mill (see map). As you approach the Science Mill on Highway 290 from either east or west, look for Snow Day parking signs along the highway. 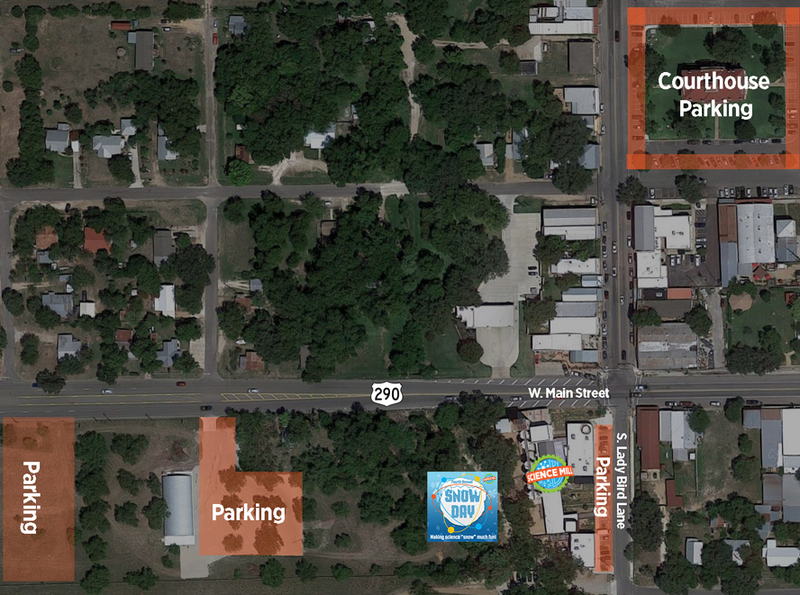 If you’re using GPS, the address 111 W. Main Street, Johnson City, TX 78636 will get you to the parking lot. When that lot is full, visitors will be directed to Courthouse Square to park. It looks to be appropriately COLD and WINDY for Snow Day. Snow Day activities are outside. Please dress the kiddos in warm clothes and don’t forget mittens or gloves to keep your hands warm! Online ticket sales will end at 5pm on Friday, January 18, but additional tickets will be available for purchase at either entrance on Saturday. Science Mill staff will have a list of pre-purchased ticket holders at the entrances. You will need to provide the purchaser’s name and show ID. You do not need to print your tickets. Science Mill Members do NOT need to purchase tickets to Snow Day. Follow the signs to the Member check-in area. Thanks so much! Please let us know if you have any questions at info@sciencemill.org. We’re looking forward to a fun, family-friendly day of science and snow!! !